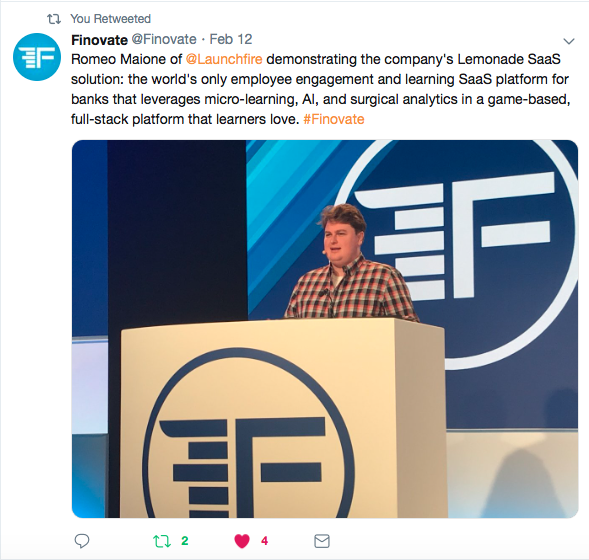 Launchfire Voted Best of Show at FinovateEurope! Launchfire was voted best of show at FinovateEurope, one of the biggest European fintech events of the year. Alongside roughly 60 other innovative companies, we showcased our all-in-one learning experience platform, Lemonade, which helps financial institutions level up their training and transform their frontline. 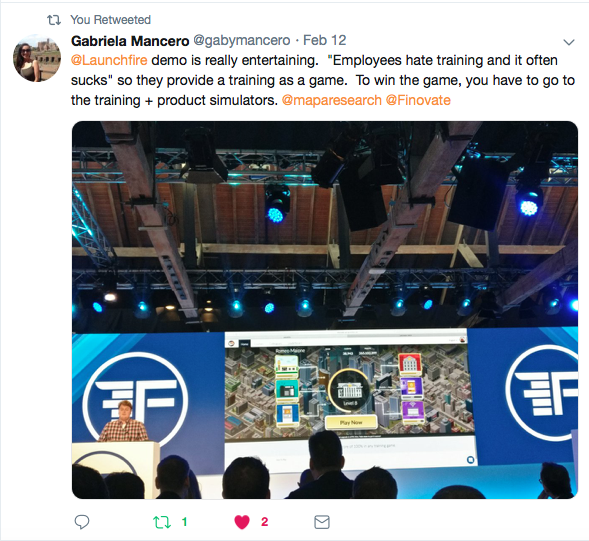 On the first day of the event, our program designer, Romeo Maione, demonstrated how Lemonade's game-based learning, product simulations, and role-play scenarios make learning fun (and more effective) for frontline staff — while machine learning analytics and easy built-in course authoring helps admins deliver better training faster. You can watch our demo from last year here. Director of Business Solutions, Romeo Maione, will be demoing Lemonade, the game-based microlearning platform for financial institutions next month in San Francisco. Director of Business Solutions, Romeo Maione to speak at the conference in Charlotte, NC on April 10th, 2019. Launchfire will be the presenting sponsor at this year’s Association for Talent Development New England Area Conference. Launchfire was voted best of show at FinovateEurope, one of the biggest European fintech events of the year. Program Designer Romeo Maione will demo Lemonade, the all-in-one learning experience platform for financial institutions next month in London UK.